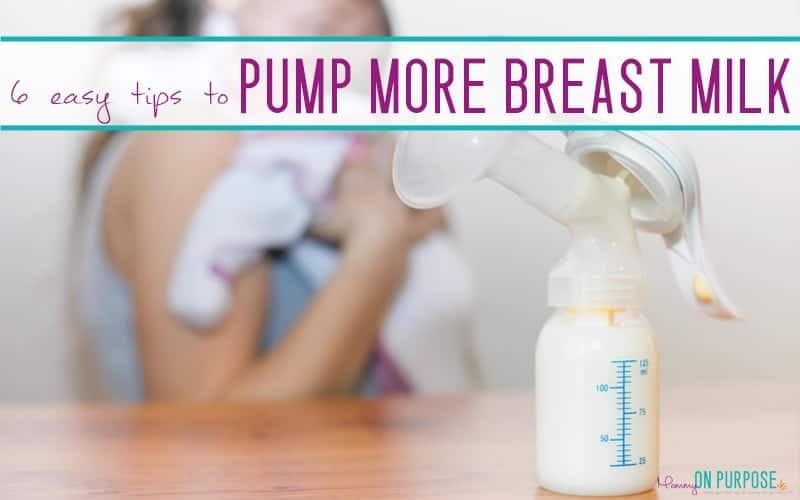 How to pump more breast milk – 6 tips from a momma who worked and pumped! 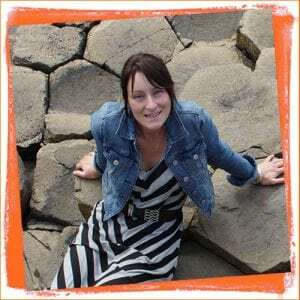 This is a guest post from Jen, a Registered Nurse who blogs at Minnesota Momma and has a passion for obstetrics and breastfeeding. She returned to work when her babe was 5 months old and pumped 3-4 times a day to give him the best nutrition she could. Here are her top 6 ways to pump more breast milk! BUT. I promise, it gets easier and you get so much better at it. You’ll be a pumping pro in no time if you follow these easy tips to get the most milk from your pumping session. 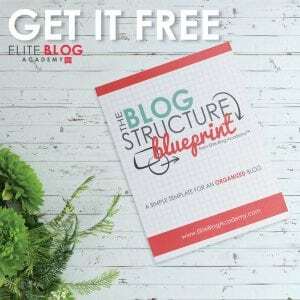 As a bonus, you can implement these tips right away – no extra supplies needed! If you’re trying to get more milk from your pumping sessions, spend a little time manually expressing. Start by pumping, theh when it looks like there’s no more milk to pump, remove your pump and manually express into the bottles. It might feel awkward at first, but it’s easy once you get the hang of it. You could end up getting an extra couple ounces at each pumping session. Think of all that milk! If you manually express at each pumping session, you can end up with an extra bottle of milk at the end of the day. Women come in all shapes and sizes, so no one breast pump is going to fit everyone. If you feel like you should be getting more milk during your pumping sessions, check to be sure the breast shields are fitting you properly. This can make a huge difference! For example, if the shield is too small – some of the milk ducts are being blocked and the milk cannot get from them to the bottle. If the shield is too big – the pump is pulling too much, which means the compressions or pumping isn’t happening in the right place. This can also lead to not completely emptying your breasts. Research shows that double pumping is the most effective pumping method. Double pumping is pumping on both sides at the same time. When you double pump you’re much more likely to empty your breasts (especially if you also manually express). And bonus, it takes less time! This is a fantastic double pump. Be sure to read the instructions on your pump. It can be a common misconception that setting your pumping speed to the highest setting will get you the most milk in the shortest amount of time. While I wish this trick was true, it’s a little bit more complicated than that. The goal of the pumping speed is to mimic your baby’s eating habits. This gets a little confusing. It’s not talking about the length of typical feeding, but the actual speed of your baby’s sucking. If your baby really nurses at a fast speed, then a higher setting may be right for you. If your baby likes to take his or her time then start lower. You can always adjust the speed until you find the sweet spot. Remember that pumping should never be painful. If it is, start by re-reading the instructions for your pump to ensure you’re using it right. If that does not solve the issue, talk with your doctor or a lactation consultant. You’ve probably woken up once or twice with a wet shirt or feeling engorged. Therefore, it’ll probably come as no surprise to you that you have the most milk in the morning. This is the very best time to pump! When your baby wakes up in the morning, nurse him or her on one side and pump on the other. This is the only time you shouldn’t double pump. 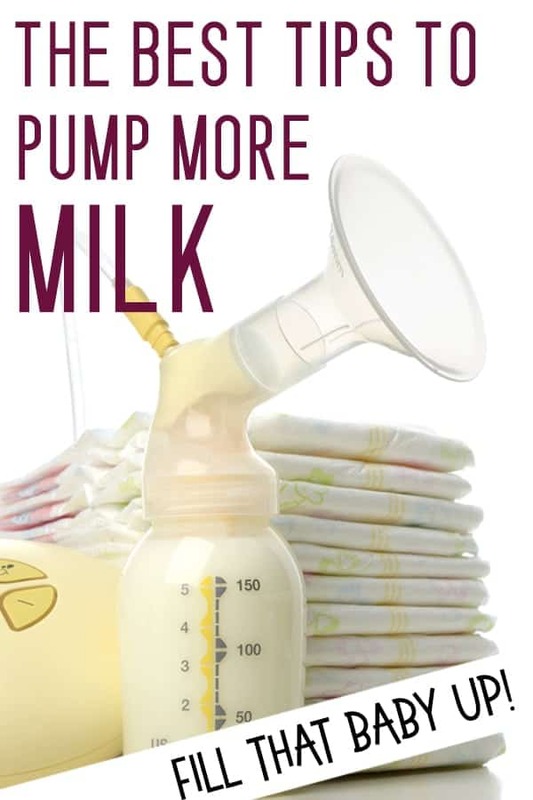 Your baby does a fantastic job of creating the let down effect (let down = when your milk starts to flow), so your milk will likely start to flow quickly even on the side you are pumping. This also saves you time and lets you multitask! Whether it’s an extra pumping session during the day or while your baby is sleeping at night, the extra session will help stimulate your milk supply and give you great results! Breastfeeding and pumping is based on supply and demand. Adding another session causes your body to think it needs to make more milk. Don’t panic if you don’t get much milk right away during this new session. It can take a couple of days for your body to build up that extra supply – but if you keep it up, your body will repay you! This trick is another one of my favorites, because anyone can do it. There’s no special food or supplement required, just a little extra time! Easier said than done, right? Unfortunately, stress causes your milk supply to decrease. So do your best to relax and let the milk flow! Some helpful tips include sitting and looking at pictures of your baby, reading a book, listening to soft music, or taking calming deep breaths. Some women will notice an immediate difference once they try these tricks and the milk will just start flowing! Having a proper support system can also greatly decrease your stress. Your workplace should have a pumping policy for new moms that allows you this stress free time. Invite your husband along to a breastfeeding class, so he knows how to support you while you breastfeed or pump. Or talk with close friends or family who have been through it before. You can do this! 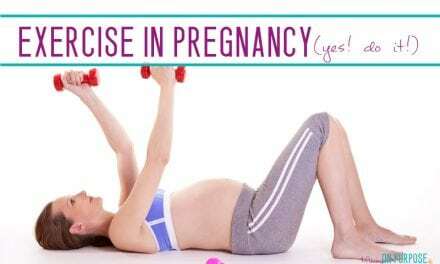 Hopefully these tips help ease some of your pumping worries! 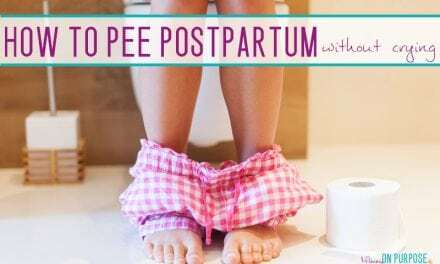 Follow my steps and you should be on your way to many successful pumping sessions in no time! Increasing milk supply in general will also help you to pump more milk (since there will BE more milk!) Here’s Jen’s Top 6 Ways to Increase Milk Supply.